A great find for me... if a little out of my usual make-up price bracket! I'll start my saying that I'm not really a big make up person. I don't wear it for the office, and probably only wear it a handful of times a month. I've always just bought relatively cheap products as I don't really get how different they can be and I don't want to feel like I'm being conned out of bucket loads of money. 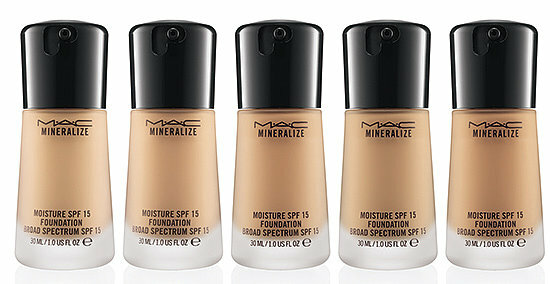 But I've always struggled with foundation; trying to find one that doesn't highlight dryness and flakiness seems impossible! And that's why I had a go at making my own foundation from mineral make-up and coconut oil. 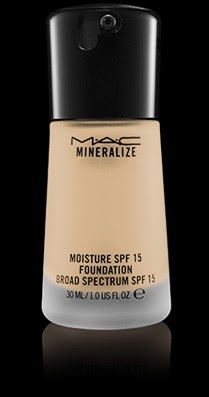 However I heard a blogger mention Mac Mineralize foundation on tumblr and asking for feedback - the overwhelming response was that it's no good on oily skin but perfect for dry and sensitive skin. Aha! I thought. This could be the foundation for me. I took the opportunity of a recent holiday to visit the MAC make-up counter at Manchester airport. The lady tried two different shades on me, one on each jaw, NC20 and NC15, the latter being the lightest one they do. It was perfect on my pale skin. (The lady did say I could always 'warm it up with a bit of bronzer' oblivious to my gothy leanings and lack of anything resembling bronzer.) I decided to go for it - can't argue with duty free prices! I think it came to about £22 (it's £27 on the MAC website). It seems devotees refer to themselves by these codes - so looks like I'm an 'NC15 girl' i.e. pale and pasty. The bit of make-up that the assistant put on me gave me no reaction whatsoever, and so I was looking forward to trying it out for myself when we got to our holiday destination. 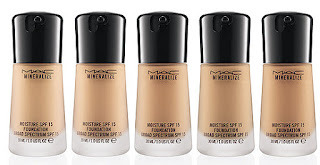 The consistency is quite different to the liquid foundations I have tried before. Usually they just glide on but this seemed to stick more to my skin so the best way to apply it was to pat it on with my fingertips, probably because it's better coverage than I am used to. It was really good at covering the spots on my skin. (Yes sadly I do still get hormonal spots on my chin despite having really dry skin.) People have described this foundation as 'very dewy', as opposed to 'matte' but this doesn't bother me in the slightest as usually I cover my skin in oil/ moisturiser anyway before applying foundation so my skin always ends up a bit shiny. I did I want to put some powder on to take a bit of shine off, and it did make me think I should invest in some better powder as the cheapy stuff I put on did end up looking a bit cakey. (Oh dear the marketing machine is getting to me... ) I do like a bit of a subtle sheen on my cheeks and on my brow bone though so I just took the shine off on the T-zone and just under my eyes. I love the fact that this has SPF 15 in it, and though it is expensive, a little goes a long way and it's easy to dispense just a tiny bit. I must confess I have found myself perusing the MAC website and wondering what else I could try - this could get expensive! I'm tempted by the 'skin finish' powder which has rave reviews and the lip conditioner too as I always get dry flaky lips - especially in winter. I really like that they have so many in depth reviews on there and clearly lots of die-hard fans. If I treat myself to anything else I'll be sure to review it on here for you :) Have any of you tried MAC make-up? What did you think?